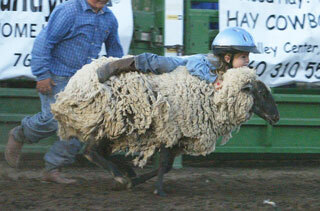 Our Mutton Bustin’ event is open to all Cowboys and Cowgirls ages 4 – 7 Years old with a weight limit of 50 Lbs. or less. Helmets and protective vests will be provided to all contestants. All contestants win a belt buckle. The Valley Center Stampede Rodeo Novice/Junior Barrel Race competition is open to all contestants 15 years of age or younger. Contestants must be able to have full control of their horse throughout their barrel runs to perform in our rodeo performance. This is a FUN event that is offered to beginner/novice barrel racers and horses. ALL contestants win a buckle. The entry fee is $50.00 and parents must sign a liability waiver to allow their children to participate. Helmets are required. Saturday entries are now full. Friday spaces still available. Check back for additional event postings. The Valley Center Stampede Rodeo & Memorial Festival relies on the generous contributions of sponsors, vendors and others who enjoy this family-friendly event. Your donations to the Rodeo are welcome and appreciated! One of the highlights each year is the crowning of the Valley Center Rodeo Queen, Junior Queen, Young Miss & Little Miss. 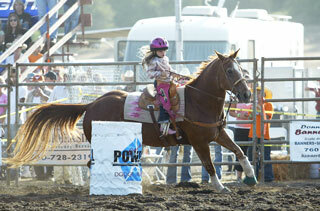 The new Valley Center Rodeo Queen is crowned each April and represents the Valley Center Stampede Rodeo each May. 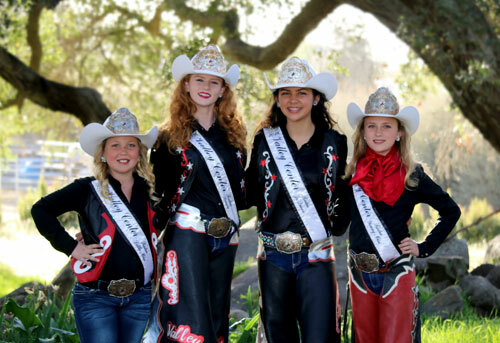 To learn more about the pageant and see the current title holders, please visit the Rodeo Queen site.